June 17th, 2013 - COLUMBUS, Ind. 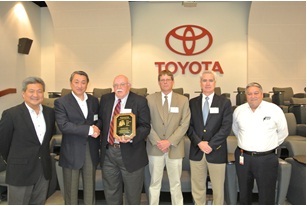 - Toyota Industrial Equipment Mfg., Inc. (TIEM), the Indiana-based plant responsible for manufacturing the majority of Toyota's lift trucks sold in North America, announces the winners of its annual Supplier of the Year Award. TIEM recognized several suppliers for their contribution to exceeding high standards of excellence in the areas of Safety, Environment, Quality, Cost and Delivery during the company's annual Supplier Conference and Awards program. "The ability to provide the highest quality forklifts to our customers while maintaining exceptional service is heavily dependent on the performance of our suppliers," said Tom DePalma, vice president of Quality, Purchasing and IT for TIEM. "This award reflects both our suppliers' commitment to excellence, as well as our appreciation for their hard work and dedication. We are pleased to have these suppliers among this year's winners." Suppliers are evaluated based on their safety performance, environmental impact, parts quality rating, ability to meet cost reduction targets, and on-time delivery performance. All points are awarded based on a corresponding scale for the fiscal year. This year, eight winners earned the coveted award, from more than 360 suppliers used by TIEM. Aisin Drivetrain, Inc. - Crothersville, Ind. ECCO Group - Boise, Ind. KYB Americas Corporation - Addison, Ill.
Pentzer Printing - Columbus, Ind. Toyoshima Special Steel - Indianapolis, Ind. Wayne Metals - Markle, Ind.